Are you the proud Papa of a little angel? Congratulations! Now you are a father of a tiny infant(s) that will need you night and day. There will be times of unimaginable joy and there also will be challenging days too. Be prepared. Your little one will need all hands-on-deck. Be ready to roll up your sleeves at a moment’s notice. Don’t be scared. It will be a working progress. In order to prepare for what’s ahead, we have created a couple of ways you can help out. Your life has now been turned upside down and your priorities will shift into caring for your baby. Most parents find this change very difficult especially the first few weeks of your newborn’s life because your baby will need your attention around the clock. Rest assured, the baby’s schedule of wake and sleep times will start becoming routine after the first few months. Sleeping through the night is very rare when you have a newborn. The lack of sleep will be a major change that no one is ever prepared for. Your newborn will wake up to eat, need a diaper change or just need some attention. Be sure to sleep whenever possible and take advantage during nap times too. It is best to work as a team. Create a game plan with your partner on who will get up to attend to the baby. But both parents must try to be flexible on who wakes up to take care of their crying newborn. You both will be exhausted but taking turns also helps the nightly needs of your baby. It will feel like a balancing act most days. Your partner will be focusing solely on the baby and its needs. Your partner will need your love and support more than ever even though she will not say so. They will need you to help them. Sometimes watching the baby so she can take a shower is pure heaven for a new mom. Most likely, you both will feel overwhelmed and feel frustrated at times with the chaotic days of a baby. Give each other time alone to bond and ensure rest for the other. WebMD states “Don’t forget your partner is in this. You can and should - share in the worries, but also the joys of parenting a baby”. Your partner will also need your support emotionally and physically. She will need you to help her navigate through the exhausting nights of feedings, changing of diapers and also daily household chores that need attention. If you have other children, try to alleviate some of the stress of the new baby and play with thee older child. The other child(ren) also need your attention. Do little things around the house to help out. Little babies create tons of laundry. Maybe do a load or two. Don’t forget that everyone needs to eat. Cook. Your partner will appreciate your efforts. Communicate. Be sure to talk to one another and appreciate the little things your baby does each day. According to the American Academy of Pediatrics, a father’s involvement and influence on their child’s health creates positive child developmental and psychological outcomes over time. Bonding with your baby is very important for you both. Most new dads rely heavily on the mom to feed the baby. But it’s vital that you try to bottle feed your baby and have one-on-one time together. You can talk or sing to your baby so he/she gets used to hearing your voice. You can also play with the baby during tummy time. If you are able to get paternity leave from your job, this is a great opportunity to build a strong bond with your child with very little distraction. You can focus solely on your baby with your partner. The first few weeks are very important in setting up a routine for the entire family. But if you have to balance work and home, be sure to find time to spend with your baby before or after work. Your partner will appreciate the time to relax a bit while you take care of the baby’s needs. There is no joy like the bond you share with your baby. It is a feeling like no other. Enjoy the time you have together while they are little. Babies grow very fast and when you blink, they have grown up before your eyes. Every baby has similar needs. They need to eat, have their diaper changed and they need to sleep. Most say Eat, Sleep, Poop. Repeat. What do you enjoy doing with your baby? Every dad will have a different answer. You have to decide what you feel most comfortable doing with your baby. 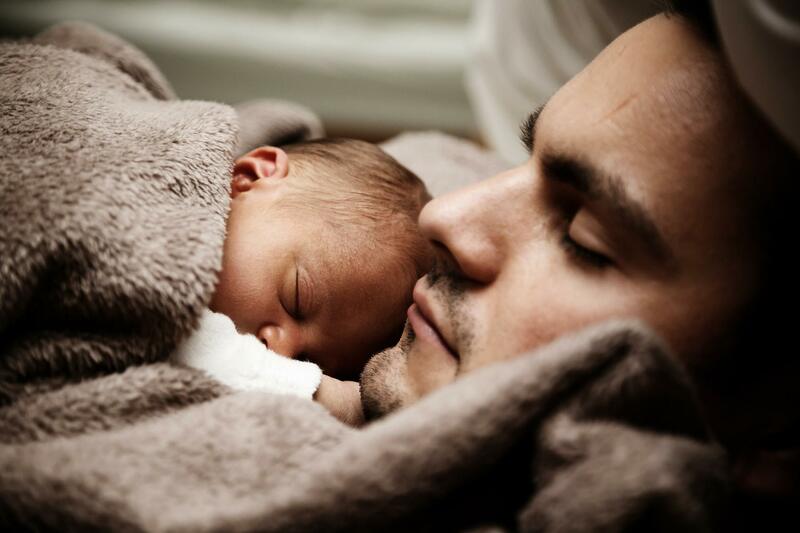 Some dads enjoy developing the sleep routine and use this opportunity to spend quality time together. They enjoy giving the baby a bath, cuddling and singing to the baby, reading a book and putting the baby to sleep at night. Others prefer the waking hours by going on walks around the neighborhood with the baby or playing with the baby at home. Time spent with your baby has a big impact on their development. Whatever you decide, remember you and your partner are teammates. Help each other out and be proactive. Developing a stronger bond between you two is also important. Encourage each other and find solutions that work for both. When you become a father for the first time, life changes. It’s not about you anymore. It’s about your baby. Nurturing and supporting your partner and baby are your new priority. Make sure to have patience and understanding during the challenging times and cherish the wonderful milestones ahead. Your help will mean the world to your family. Be a team player. It goes a long way.